The union which represents CTA rapid transit workers says one of their switchmen is being "scapegoated" in connection with the Blue Line accident which injured 33 people September 30. Union president Robert Kelly released a statement Thursday saying the switchman was charged, suspended and put on probation. "This is absolutely ludicrous," Kelly said. "We will fight this through the grievance process, and I am confident we will prevail." The train was characterized as a runaway, and the NTSB issued a series of safety recommendations in the aftermath of the accident, finding that the unmanned train blew through at least five emergency mechanisms designed to stop it. At each one, investigators say the four-car train stopped momentarily, then started up, because a master lever on an operator's console had been left in a setting which allowed the brakes to recover and reset from the application of the emergency brake. NTSB investigators determined that the train managed to travel almost a mile downhill, before reaching the Harlem avenue station, where it collided with an outbound train. The Union said the CTA's action violated their status as a party to the ongoing federal probe. Kelly said he would rethink having any member cooperate with any investigation, "if it would be used against that member." The National Transportation Safety Board says an unmanned "ghost train" involved in a Blue Line crash which injured more than 30 riders Monday, blew through five emergency mechanisms designed to stop it. Phil Rogers reports. CTA spokesman Stephon Mayberry called Kelly's claims "nonsensical, factually incorrect and ironic." The CTA is in the process of pursuing discipline against a small number of employees it has determined played a role in the Blue Line incident-discipline bolstered by the facts in the case. The NTSB is aware of the discipline, which is ongoing. Ironically, it is Mr. Kelly himself who has violated the NTSB party status by running to the media to discuss issues the NTSB clearly directed all parties not to make public. Alarmingly, Mr. Kelly has also suggested that his union would not cooperate with investigations related to the safety and security of CTA customers. Such an action would jeopardize CTA's ability to ensure the safest environment possible for customers. Nearly every time the CTA attempts to discipline a 308 worker for any safety or security violation, Mr. Kelly responds by threatening CTA management in the media-apparently in an attempt to circumvent the clear and fair disciplinary processes spelled out in the collective bargaining agreement he agreed to. 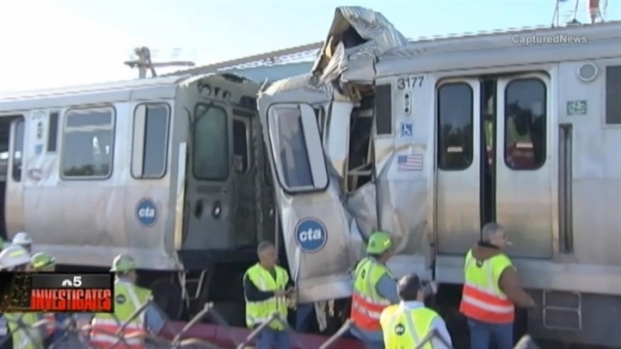 It is unfortunate that Mr. Kelly's prioritizes protecting his members over efforts to ensure safety for CTA customers. Meanwhile, a woman and her granddaughter who were injured in the crash filed a lawsuit against the transit agency Thursday. Bethena Davis, 65, and her 4-year-old daughter were passengers in the first car of the westbound train that was struck by the “ghost train,” according to the the suit filed in Cook County Circuit Court. It claims Davis and her granddaughter were injured in the crash, and the CTA had a duty to provide safe transportation to its paying customers. The three-count suit seeks at least $200,000 in damages. It is at least the second suit filed in the crash. Kim Quatch filed a lawsuit Oct. 2, alleging she was a passenger in the occupied train and was left with multiple injuries from the collision. She is seeking at least $50,000. A CTA spokesman did not immediately comment on the lawsuit. Additional information provided by the Chicago Sun-Tiimes.